I’ve gotten quite a few requests for a budget printable since I first created the Life Your Way printables more than 3 years ago, and I kept putting it off because I just wasn’t sure how to make one that would work for everybody. However, last week I got two requests from readers within hours of each other, and I decided to just dive in and put one together. The result is a 3-4 page budget worksheet (3 full sheets or 4 half sheets) that you can use for your monthly budget. This worksheet not only helps you project your income and expenses, but there’s also space for you to record the actual dollar amounts at the end of each month so you can compare your budget with your real-world spending. I think that’s important because it lets you see where you’re being unrealistic or undisciplined so that you can budget more accurately — and stick to your budget more faithfully — in the future! 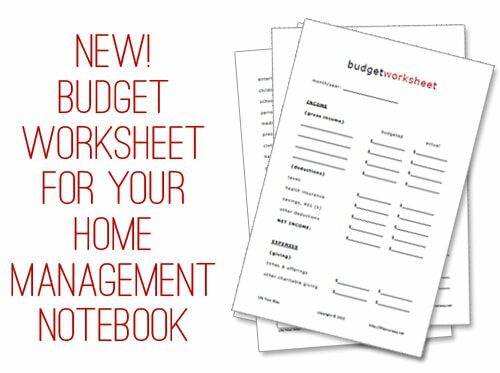 See all of our home management notebook printables here. What other printables do you think are missing from our collection?